The medals are complemented by fourteen war posters, which demonstrate commonalities between both mediums. The Art of Devastation is among recent museum exhibitions, at the Musée d’Orsay, British Museum, and other institutions, to feature the medallic arts. 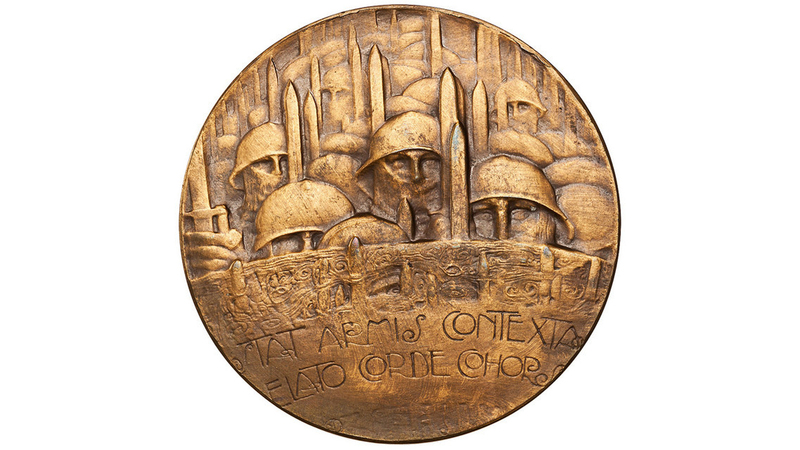 Before the war began, the commemorative and propagandistic functions of the art medal were already well known. Established in Renaissance Italy in thefifteenth century to memorialize emperors and aristocrats, early medals came into being through the revival of interest in antiquity, with particular attention to ancient coins and the imperial portraits they bore. Soon afterwards, enthusiasm for the medal expanded to Germany, where in the sixteenth century it became a vehicle for celebrating emperors as well as city officials, diplomats, bankers, and art patrons. Medals became increasingly important in the art world. Often shaped like a coin, the medal traditionally bears a portrait with an inscription on the front, and a related image, sometimes with text, on the reverse. By the turn of the twentieth century, the art medal had become an important medium of more reflective, intimate, and private artistic expression. 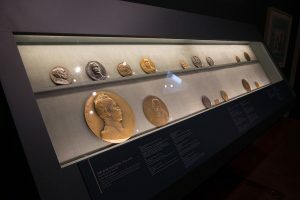 “ During World War I, tens of thousands of different types of these medals were produced on both sides, consuming scarce metallic resources,” says Peter van Alfen, Margaret Thompson Curator of Ancient Greek Coins at the AmericanNumismatic Society and co-curator of The Art of Devastation. “ This underscores the fundamental role that medals played in fêting heroes, marshaling support, directing public opinion, and, more poignantly, expressing disgust.” That medals could attain such importance is largely lost to modern audiences due in part to the seriously diminished role that medals play in today’s societies, and also because medals have been overshadowed by more artistically accessible and public forms of communication like the poster. “ There are actually numerous parallels between First World War art medals and posters, including state and institutional sponsorship, the use of similar or identical imagery, and their function of urging action,” explains Patricia Phagan, the Philip and Lynn Straus Curator of Prints and Drawings at the Art Center and co-curator of the exhibition. The exhibition features medals by German medallic artists, like Karl Goetz (1875–1950), who abandoned the use of classical allegory and allegorical figures that continued to adorn medals produced in France and the Low Countries and that served to distance the viewer from the horrors of the war. German artists embraced the horrors. Often grotesque and satirical, their medals depict death, destruction, and personal calamity with an immediacy and bitterness wholly absent in the work of those on the far side of the trenches. Medallic artists such as Goetz responded to the sinking of the British ocean liner Lusitania in 1915, with verboten weapons clearly on view on the deck. The sinking of the Lusitania led to a wave of anti-German publicity and—not surprisingly—recruitment posters in Great Britain. The British artist Bernard Partridge (1861–1945), well known for his political cartoons for Punch magazine, responded with the much-reproduced, allegorical recruiting poster Take Up the Sword of Justice. In this piece he presented a vivid and defiant Justice standing upon the sea with the wreck of the ship behind her, taking on water and tilting at the horizon, passengers strewn among the waves. Meanwhile, medallic artists in the U.S., sometimes with the support of institutions like the American Numismatic Society, began to express their views on the conflict. Many of these artists had trained in Paris before the war and so were thoroughly steeped in Beaux-Arts style. This includes the elegantly rendered medal, Peace as Woman, created by an unknown artist for Tiffany and Company in New York. Many American medals were produced in support of the Allied cause and also adhered to the same cautious refinements and use of allegorical figures.